St Mark was born in the city of Cyrene in Pentapolis located in western Libya, North Africa. Three years after the birth of our Lord and Saviour, St Mark was born of Jewish parents. St Mark's original name was John and he is mentioned repeatedly in the Acts of the Apostles. He is also mentioned in the letters of St Paul. Shortly after the birth of St Mark, his parents moved; his father Aristopolos and his mother Mary, to Palestine. This was because of the barbaric attacks that hit their town and property. They settled in Cana, Galilee, close to Jerusalem. After a few years St Mark's father died and St Peter, who became one of Jesus' 12 disciples, took care of St Mark, which explains why St Peter refers to him as his "son". "Mark, Peter's disciple and interpreter, had also passed on to us in written materials as preached by Peter." The reason why it is called St Mark’s Gospel and not St Peter’s Gospel, is precisely because it was St Mark who wrote it, but St Mark wrote what St Peter told. According to the New Testament historians and professors, such as Craig L. Blomberg, the Gospel of St Mark was written around the year 60 AD. Church tradition teaches that St Mark was the first bishop of Alexandria, and therefore is regarded as the founder of the Church of Alexandria, which the Coptic Church confirms. St Mark also founded the first theological school in Alexandria to train people who would become leaders in the faith. Today, the Coptic Church is more than nineteen hundred years old. It was during Nero's reign that the Coptic Church was founded, and many who were living in Egypt came to believe during this time. St Mark had holy zeal that was stronger than all the oppositions that he encountered during his time. This was a influential reason why Christianity grew in Egypt. When St Mark came to Egypt, he found himself in a country being governed by idolatry. The Egyptians, among others, believed in the idol Ra, the Greeks worshipped the idol Zeus, and the Romans, Jupiter. All these belief systems were protected by the powerful Roman state that practiced barbaric methods to destroy Christianity. St Mark’s holy glow led him out farther than Egypt, and this meant that he had to find a bishop who would replace him. This replacement came to be Anianus, the Principal of St Mark's successor at Alexandria. 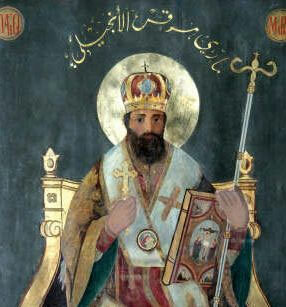 Today's successor of St Mark is the Pope of Alexandria, Shenouda III. Pope Shenouda III explains holy zeal as having the following effects: It grounds the kingdom of God and makes it grow. I heartily recommend Pope Shenouda's book - Holy Zeal – He describes in particular, St Mark's sacred zeal and why he was able to accomplish so much in the name of the Lord Jesus. The tradition teaches us that in 68 AD, St Mark was captured by the pagans and suffered martyrdom. They had tied him to a horse and dragged him for nearly two full days through the streets of Alexandria until his body was torn into pieces. This shows how our Church Fathers fought and struggled for our faith and suffered martyrdom, in order for us today, to be able to stand firm in our faith. St Mark's body parts were collected, and today his head is in a church in Alexandria, which is named after him. The rest of his relics rest in San Marco Cathedral in Venice, Italy. To conclude, I pray and hope that we, as St Mark, struggle for an inner holy zeal: for a true and strong faith. May the Lord live in our hearts always.